When healthy cells degenerate into tumour cells, their metabolism changes and with it also the composition of the metabolic products. At the University of Konstanz, zoologist Giovanni Galizia has experimentally proven the fact that fruit flies can detect these fine variances with the olfactory organs of their antennae and that they can even differentiate between different kinds of breast cancer cells. For their experiment, the team around Galizia - biologists and engineers from the universities of Rome and Konstanz - affixed fruit flies to a podium and subjected their olfactory antennae to the volatile substances secreted by the metabolic products of both healthy and diseased cells. To obtain these "scents", they filled one millilitre of the nutrient solution in which the cells had previously been propagated into glass phials. In these sealed containers the volatile substances now could accumulate. The "scents" from healthy cells and from five different strains of cancer cells were then extracted from the glass phials with a needle and successively blown through a fine tube onto the olfactory organs of the fruit fly antennae. Fruit flies have more than fifty different kinds of olfactory receptors on their antennae. These each register different scent molecules and thereby trigger reactions in the olfactory sensory cells. Depending on its composition, a scent thus provokes a characteristic stimulation pattern. A fluorescence microscope was used to observe how the neural cells of the laboratory animals reacted to the various olfactory samples. Emitting light rays of a specific wave length, this microscope prompts precisely those proteins to glow, which the six laboratory animals produce after genetic manipulation of their olfactory sensory cells. And they glow particularly intensively, when calcium influxes into the cell. Calcium is an indicator for neuronal activity. By this means, the distribution of light in the captured images illustrates the activity patterns of the olfactory sensory cells. By comparing the activity profiles of the six laboratory animals, the scientists found out that all fruit flies react to the scent of diseased and healthy cells with a characteristic stimulation pattern in each case. The evaluation revealed also: the animals were not only able to differentiate between healthy and diseased, but also between various kinds of breast cancer. The olfactory molecules of two different groups of breast cancer cells each evoked a specific pattern in the animals. The knowledge that animals with their very finely honed olfactory sense can differentiate between cancer cells and healthy cells is not new. In the past five years, scientists have predominantly conducted experiments with dogs. After training by dog trainers, the dogs were able to identify breath samples of patients who had been recently diagnosed with cancer. 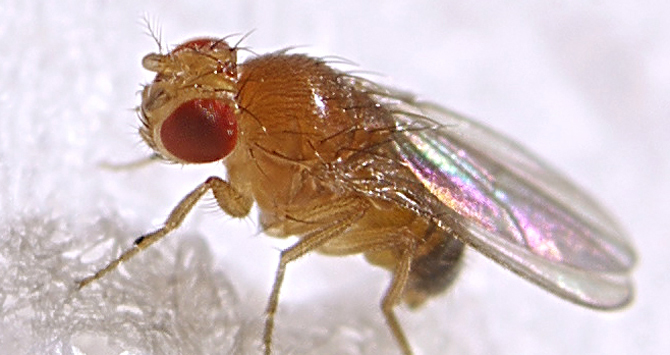 "Yet the aim of our experiment is not to prove that fruit flies are likewise able to smell cancer", says Galizia. "We want to find out which receptors react to which molecules." For this, the fruit fly is a well-suited model. Its genome is fully sequenced, it is easy to genetically manipulate it and the number of its olfactory receptors is manageable compared to mammals. The distant goal of Galizia's research is the development of an artificial sensor that imitates the biological olfactory mechanisms and thus is capable of analysing a broader spectrum of scents with greater detail than established technical sensors, so-called electronic noses, which measure the concentration of gases and currently are employed in industry and military applications. However, Rudolf Jörres from the Klinikum der Universität München (KUM - University Hospital Munich) cautions against setting expectations too high: "I deem Galizia's research approach to be very sensible. We can try to learn from these flies, just as we learn also from the dogs. But when we start thinking about clinical application, we should know more definitely what we what to measure in which way and in whom." Jörres himself experiments with electronic noses to find out whether these can be used to diagnose additional disorders of patients with chronic lung diseases. He says that currently it remains uncertain whether artificial sensors - if they are capable of improved scent detection in future - would actually provide additional benefits for patients. For in the case of cancer it remains as yet unknown whether it already "smells" to a measurable degree before it spreads so much in the body that it can be diagnosed also with traditional methods such as ultrasound, computer tomography and magnetic resonance imaging. However, if this were to be the case, tumours could be detected in the breath or blood far earlier with such highly sensitive noses - and thus treated earlier. "Yet this we will know only in ten years when we have more clinical application data available", says Rudolf Jörres. He makes tumours glow and transforms laser light first into sound waves and then into 3D images: engineer Vasilis Ntziachristos provides medical practitioners with improved insights into the body. "We still know too little"